Designation: Assistant Professor Skin and VD Department, Gonoshastho Somaj Vittik Medical College and Hospital Savar, Gono University. List of Author(s): Houque T, Kiron NM. Citation: Houque T, Kiron NM (2018) A Case Report of Acne Vulgaris: Treated by Combination with Acupuncture. Sch J Appl Sci Res. Vol: 1, Issu: 6 (37-39). Copyright: © 2018 Houque T. This is an open-access article distributed under the terms of the Creative Commons Attribution License, which permits unrestricted use, distribution, and reproduction in any medium, provided the original author and source are credited. Acne is a chronic inflammatory disease of the pilosebaceous unit resulting from androgen-induced increased sebum production, altered keratinisation, inflammation and bacterial colonization of hair follicles on the face, neck, and back by Propionibacterium acnes. There is no ideal treatment for acne, although a suitable regimen for reducing lesions can be found for most patients. New research is needed into the therapeutic comparative effectiveness and safety of the many products available. In this case report it was evaluated, acupuncture therapy used in combination with pharmaceutical medication appeared to be more effective than pharmaceutical medication alone in increasing the number of cured patients with acne. However, further studies are needed to confirm this finding. Here a case report of acne treated with acupuncture from Bangladesh is reported and its effectiveness is highlighted. Acne is a chronic inflammatory condition of the skin. This condition most commonly affects area where the sebaceous glands are largest and most abundant: the face; anterior trunk; upper back . Mild acne is characterized by comedones, or black heads, which are dilated pores with a plug of keratin. Moderate to severe acne is characterized by whiteheads (small cream-colored, dome-shaped papules), red papules, pustules or cysts, scars, both those on the skin and emotional scars can last a lifetime. Acne affects 80% of adolescents (most commonly from 12yrs of age), but it can also affect 54% of adult women and 40% of adult men (Primarily those in their early or mid-20s) . Effective prescription medications are available, although side effects - such as local irritation, teratogenicity, dry skin, hyperlipidemia, and increased risk of depression-are reported [3,4]. A number of drugs have been used effectively as topical or systemic therapy, after combination with benzoyl peroxide or a retinoid. Propionibacterium acnes exhibits in high in vitro sensitivity to a wide range of antimicrobials, including to ampicillin, clindamycine, erythromycin, tetracyclin, doxycycline, ofloxacilline, minocycline, cephalexin and gentamycin. However not all of these drugs are equally effective in penetrating the lipid-filled microcomedon and reducing numbers of P.acnes in the skin. Antimicrobial therapy; particularly systemic treatments, may be complicated by the potential for drug-drug interactions. Antimicrobial therapy for acne has also been complicated by the emergence of antibiotic resistant strains of P. acnes. In China, in additional to prescription medications, Traditional Chinese Medicine (TCM) are used to treat acne. Acupuncture methods are based on the Traditional Chinese Medicine (TCM) view that acne is caused by any or a combination of several pathogenic factors. These include intense Lung Heat or Stomach Heat, Damp Heat with Blood Stasis, and Qi (vital energy) Stagnation. As the condition becomes protected, pathogenic Heat rises and accumulates in the skin and tissue, which brings on the lesions . Potential mechanisms of acupoint stimulation for acne are to relieve Heat toxicity, eliminate Dampness, regulate the Qi and Blood; and enhance immunologic function . Some studies also mention that acupuncture can stimulate and balance androgen levels to inhibit excess secretion of the sebaceous gland . Another systemic review  involving twenty-three trials of topical and oral complementary and alternative medicines (CAMs) concluded that poor methodological quality aside, the evidence suggests that many of these therapies are possible. However, there has been no systemic review that evaluated the clinical evidence of all types of acupoint stimulation therapies. 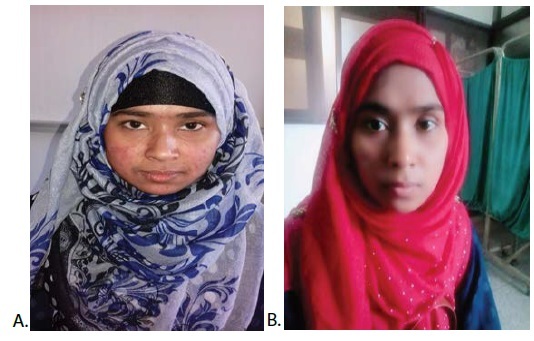 This case report was performed to assess the effectiveness and safety of acupoint-stimulation techniques used to treat acne vulgaris. A 23years of female patient came at Gonosashthaya Somaj Vittik Medical College, Savar 1yr back with the complaints of multiple small elevated scattered lesions over face, neck and back, lots of pores on the check area of her face with dark spots after disappearance of the lesion for 4 to 5years. She got no history of allergy, asthma. She took lots of cosmetics and herbal products for her fairness. She is married for 5yrs and has one female healthy child of 3yrs. She never took any contraceptive method. She took lots of antibiotics and anti-acne cream by the Dermatologist for 2yrs. There was no history of acne disease in her family members. Menstruation was regular. On local examination shows multiple papulopustular lesions over face, neck and back. Physically investigated: Under Magnifying glass there were black head and white head comedons (which are the cardinal feature of acne vulgaris). There was no pain and itching sensations. On Wood’s Lamp examination shows there were huge number of “Propionebacterium acne” organism present over the acne comedons, hyperpigmentation in the acne remission area, large pores due to acne scar. On General examination there was no abnormality detected. On Systemic examination shows her all the vital functions were normal. Clinically investigated: Her CBC count was normal, blood Sr. Testosterone was normal (15-70ng/dL), USG of whole abdomen was normal. Previous treatment has taken: She was treated by antibiotics like Cap Doxycyclin 50-100mg (orally), Cap Tetracyclin 500mg (orally), Tab Azythromycin 500mg (orally), Erythromycine lotion (locally), Clindamycine lotion (locally), Anti-Acne like Adapolen cream, Benzyle Peroxidase cream, Retinoic acid cream. Patient was treated by those medicines for 1yr. Prognosis: She cured within 6months but recurrent acne developed after stopping this treatment. Started combination: Then she was treated “Acupuncture Therapy”-3days (one alternative day) in a week for one month with combination of local anti-acne medicine. After stopping of anti-acne and Acupuncture therapy for 3months, there was no occurrence of acne recurrence. There was brightness due to disappearance of hyperpigmentation. There was improvement of acne scars also. Acne is an annoying and often painful problem that affects millions of people each year. There were some studies indicates, due to extended use of antibiotics, acne patients can build up a resistance to antibiotics, making them less effective. A study published on 2011 in the Archives of Dermatology, looked at 83 patients on Antibiotic acne medication and found that within 2months, the patients showed a 40% resistance to clindamycin, a 10% to tetracycline, and 44% to erythromycin [8,9]. Acupuncture has been used to treat hundreds of conditions in traditional Chinese medicine. There are numerous studies that prove that acupuncture is effective at improving acne symptoms. In a 2003 study published in inflammatory mediators; researchers looked at the antiinflammatory properties of acupuncture. Acupuncture may have anti-inflammatory effects and fight acne due to the stimulation of beta-endorphins, substance P; CGRP and cytokines. Low-dose acupuncture should be more effective, to prevent the high concentration of CGRP in the body (which can lead to inflammation). Acupuncture is believed to stimulate the nervous system and cause the release of neurochemical messenger molecules. Acupuncture reduces acne inflammation by releasing vascular and immunomodulatory factors. It enhances natural killer cell activities. It increase local microcirculation to disperse swelling. Acupuncture stimulate the lymphatic system which is essential for eliminating a variety of toxins from the body; these toxins when trapped in the body, can cause a number of physical ailments, including slow healing of wounds and scars in the formation of acne. Only scars that are at least a month old should be treated with acupuncture, due to increased risk of infection. The elderly, diabetics, cancer patients and tumors with neurological disorders require special care. Totally taken Acupuncture treatments for Acne vulgaris 15 patients with deferent ages recovery rate is 95%. Most important barrier we faced that is financial problem and then afraid of needle. There may be aggravation of acne after 1week of acupuncture therapy for some cases. We have discovered a new way how patient can finally get a clean, beautiful skin. Traditional Chinese medicine has many advantages and Acupuncture is an effective method how to get rid of acne with acne scars (Figure 1). A) Beginning of Acupuncture and B) After 15 days of Acupuncture Treatment. Figure 1: A) Beginning of Acupuncture and B) After 15 days of Acupuncture Treatment. I like to thanks Prof Dr NM Kiron Head of the Acupuncture Department of Gonoshasthay Somaz Vittik Medical College and Hospital for his kind support to treat those patients combination with me and give information can able to use Acupuncture treatment successfully in Acne Vulgaris.